Gamburd, Inc- your local home modification specialist. Most people are confused by the term "Home Modifications" or (home mods). In the accessibility world, we like to call any kind of accessibility related construction job a home mod. We offer a full home mods service, and we do it all in house. We are both C.A.P.S. (Certified Aging In Place Specialist) and C.E.A.C. (Certified Environmental Access Specialist) certified ensuring that you get the optimal accessible design, most innovative assistive technology and quality construction workmanship. Our home assessments are provided free of charge and are followed up with a complete report including drawings of the proposed solution. We take our work in this industry very seriously. We have been a provider of assistive technology for over 15 years and take great pride in the service that we provide. Customer care is our number one priority. We understand that dealing with disability is hard enough but it's that much worse when one can't even maneuver throughout their own home. That's why it's important to not lose focus as to what the job really entails - making a house a comfortable home once again for someone who's just endured a terrible tragedy. Home Modifications is Our Secret Recipe. 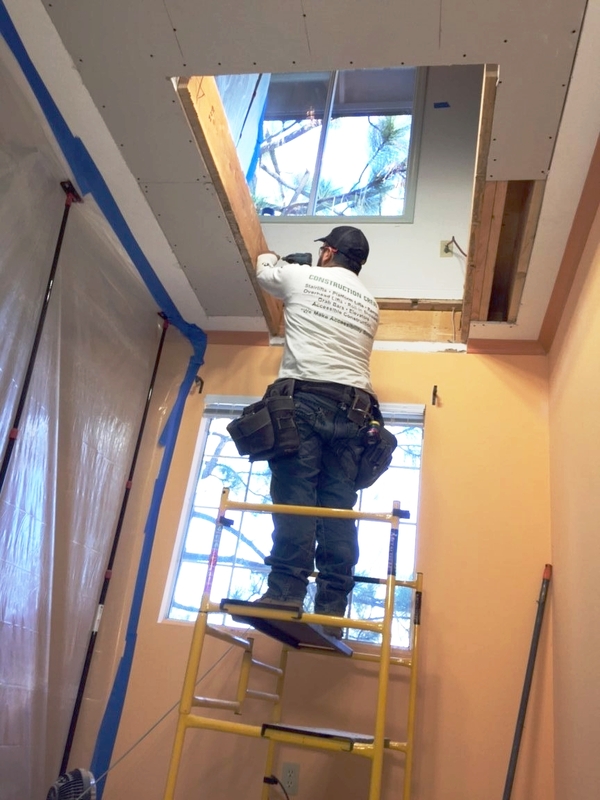 When you buy a Wessex lift, it will require construction to allow for the opening between floors, framing, drywall, patch, electrical work and more. With other contractors, you would be dealing with 3 or 4 different companies. We make things easy, no finger pointing. When you buy a product from us, we do the whole job from A to Z. We don't know it all, however we understand disabilities and the products we sell. A ramp leading to a vertical platform lift and a door opener. You are speaking our language. 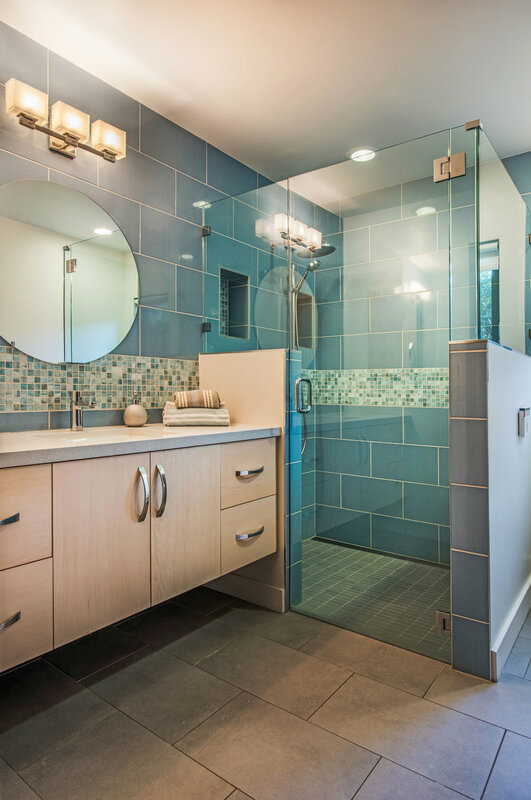 A bathroom that is suited for him or her and a person with a disability, we specialize in that. Every project is unique, give us an opportunity to show you. This custom built home in the hills of San Rafael happened to have the perfect setting for an indoor elevator. Our clients needed to make their home accessible for their elderly family members and friends with disabilities. A stairlift was out of the question as their aim was to provide full access for a wheelchair bound friend. At first glance our technician noticed that in the corner of their home, their first and second floors both had identical closets, one right over the other- a perfect space for the elevator to be housed! Construction began shortly thereafter and several weeks later they are able to host friends and family on both levels of their home with no difficulty. Salinas, CA. Overhead Patient Lift Installation that required customizing the door opening and framing. This job looks simple but due to the multiple ceiling heights it required very careful planning. Overhead patient lift are becoming more and more popular, this system is completely automatic. Our client will be able to get out of bed and travel over to a stretch table continuing onto an automatic turn table that can turn to go over the toilet or into the shower. If necessary the person can also go the opposite direction and get onto their wheelchair. Imagine a home you can grow old in. Imagine raising your children and retiring all in the same place, a multigenerational home in which your parents can visit and even stay without the worry of having to climb stairs or getting into and out of that tub/shower combo safely. Eliminating the barriers of daily living for those with disabilities is the name of our game and our plan for this home at 5041 Odessa. This next year Gamburd, Inc. invites you to join us on our journey to build the ultimate, luxury, fully accessible, custom home. We met the Lobato family in 2013 and installed 2 simple ramps to allow their daughter Elizabeth to exit the home from the front and side of the house in her power wheelchair. Once the ramps were complete, Elizabeth's dad Terry entertained the idea of making the bathroom accessible so that Elizabeth can shower on her own. We were hired to construct a new staircase and install a stairlift once it was completed. The staircase had to be built around existing slopes which would prevent for a perfectly straight rise and tread. Once the staircase was built we made custom brackets for the stairlift.